A single mom, who with her young son "lost all their worldly possessions" in the fertilizer plant explosion that devastated West, Texas, is among the first people to sue the plant's owner. Andrea Jones Gutierrez filed a lawsuit against Adair Grain on Monday. She is seeking up to $1 million. 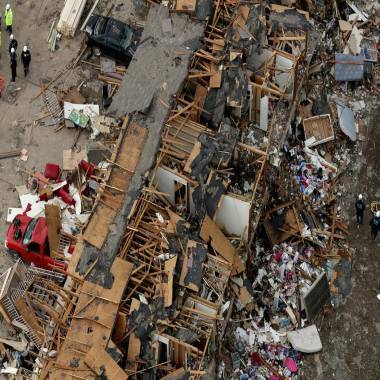 Search and rescue workers comb through what remains of a 50-unit apartment building the day after an explosion at the West Fertilizer Company destroyed the building April 18 in West, Texas. A fire at the West Fertilizer plant last week caused an explosion that killed 14 people, injured 200 others and destroyed at least 75 homes, according to officials. Investigators are still trying to determine what caused the accident. Gutierrez lived in the building next to the West Fertilizer plant with her 14-year-old son, who was at church at the time of the explosion. If Gutierrez hadn't walked out of her apartment complex when she first heard explosions outside, she wouldn't be here today, according to her attorney. Two other people who lived in the same apartment complex as Gutierrez died. 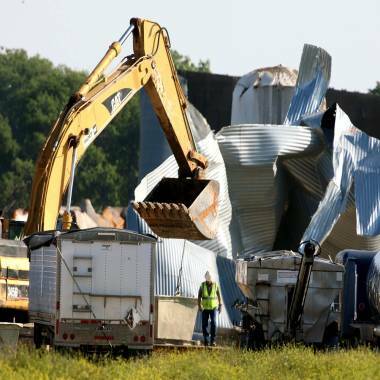 Heavy machinery is use to lift some of the debris from the West fertilizer plant Monday. The plant explosion plant explosion killed 14 people and injured more than 160 others. The company "was negligent in the operation of its facility, creating an unreasonably dangerous condition, which led to the fire and explosion," said a lawsuit filed Friday by insurance companies on behalf of individuals, two churches and businesses including a Chevrolet car dealer and a bakery.